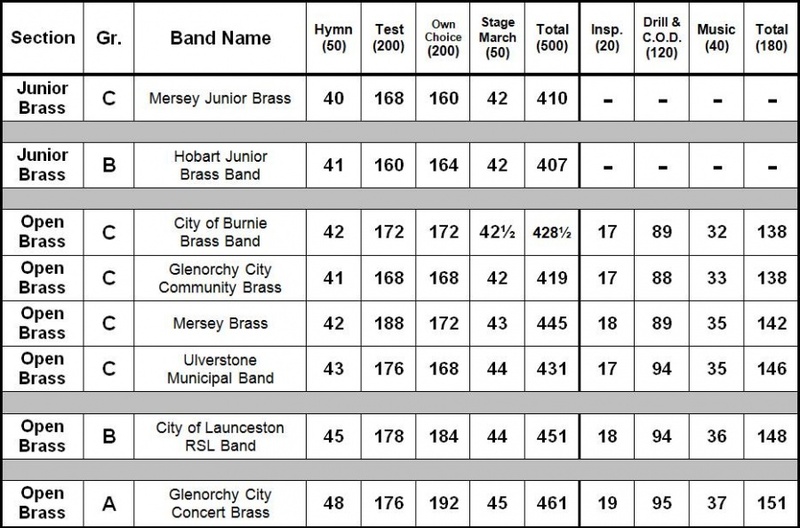 commented on "The City of Launceston RSL Band continued their winning streak at the TBL State Band Contest last weekend! ..."
The City of Launceston RSL Band continued their winning streak at the TBL State Band Contest last weekend! The Tasmanian Band League's - State Contest 2013 - is a weekend event, bringing together young and old, brass band and concert band, musicians and supporters from around Tasmania to perform at their very best on stage for an adjudicator and audience. This year the contest was held at Evandale Primary School Saturday 14th and Sunday 15th September. With only an eight week window for contest preparation, the City of Launceston RSL Band's focus moved from playing and performing concerts and fundraising gigs for our enthusiastic supporters and audiences within the Launceston community, to rehearsing contest music. This year's set piece (Firestorm) and own choice (Shine as the Light) plus two marches (Eagle Squadron & Cairo Red Shield) and hymn (I Know Thou Art Mine). The band's Musical Director, David Potter, has been working consistently throughout the past three years of his appointment as conductor to improve the bands overall sound, sight reading skills and performance ability. David has achieved this through recruiting new players and positioning them amongst existing members, on the right instruments and parts, to achieve the best musical outcome and sound for the band overall. And, as the Launceston City Council's Official Band, David's preparation of the band and programming of repertoire for the average of 3 concerts/gigs per month that the band performs has led to improved sight reading and performance abilities. New and returning players are always needed and welcome to the band and in time for contest this year we were pleased to welcome back Adrian Brotherton (Euphonium), Melvyn Dobson (Tenor Horn) and current Tasmanian Bands League Junior Champion of Champions, Alex Quigley (Soprano). Previously Alex played cornet, but this year (will step) he stepped up to take the challenging soprano cornet chair. In addition, the band welcomed Jason George (Timpani/Percussion), Darcy O'Malley (Solo Cornet) and Peter Quigley (Flugel Horn). While the band had a full line up of brass players this year, the one thing they really need is more percussion players. So if you play drums or mallets the band needs you! Please contact David Potter on 0421 314 952 to join our ranks.